We have tracked two stories on Venezuela’s claim of Barbados’ waters in the Venezuelan media today. The tone of one is actually quite strident. The government of Barbados has launched an oil and gas bid for 26 offshore blocks, two of which are allegedly located in part in Venezuelan waters, claimed on Monday Aníbal Martínez, head of non-governmental organization Frente Nacional Pro Defensa del Petróleo Venezolano (National Front for the Defense of Venezuelan Oil). Martínez said that the government of Barbados put 26 oil and gas blocks for tender stretching more than 70,000 square kilometers. He added that there are two blocks in the bid, called Botton Bay and Crane Bay, 70 percent of whose area would be in Venezuelan waters. “This amounts to an area of 5,200 square kilometers. It is a hostile act on the part of Barbados, and we have to be on alert. Even if it was one square centimeter, we cannot let this to happen,” said the Venezuelan oil expert. Venezuelan Minister of Energy and Petroleum Rafael Ramírez reported that the Ministry of Foreign Affairs is in possession of the evidence attesting to the sale by Barbados of licenses for oil drilling in Venezuelan maritime areas. “We took the official letter to the appropriate channels; the Foreign Ministry is working on it. This has been the case in the past, where countries, well, awarded licenses for areas that are beyond their jurisdiction and by talking, directly speaking, things are eventually placed where they should be,” said the official. What will also be interesting to watch is the reaction of Caracas to Barbados claims to the outer continental shelf. What is legally Barbados’ southernmost waters Venezuela considers to be its exit to the Atlantic (hence the Trinidad/Venezuela treaty) However Venezuela never made a treaty with Barbados, and Barbados has no reason to negotiate one as it is a small slice of their territory. The Venezuela/Trinidad treaty has no impact on Barbados or Guyana, so it will be interesting to see where this goes. It is unlikely that this will go away. Further Barbados has little reason to take on Venezuela’s claims other than Venezuela has the means to agressively enforce its claims on the area by force of arms. Hopefully this will not go that far. After much thought we’ve decided to come out of retirement to blog on the subject of Venezuela’s claim of Barbados’ waters. This is not a full re-opening of NFTM but we felt that given our history of blogging on Venezuela and it’s territorial claims that we might be able to provide some clarity on this issue. This article is freely reproducible (once the source is attributed). In fact we would ask that given the potential seriousness of the claim that members of the blogosphere and other media propogate this story. The new government of Barbados opened the bidding process for rights to offshore blocks for oil & gas exploration on Monday and will close it on September 30. The winner announcement will be made on Nov 20th. More than 20 companies were present this week in the bid kick off, including among others, Exxon, Gazprom, Lukoil Shell, BHP Billiton of Australia, Hess Oil Company, Anadarko Petroleum Corporation, Marathon Oil and Murphy Oil, all of the United States, StatoilHydro, Petro-Canada, and Petrobras from Brazil. 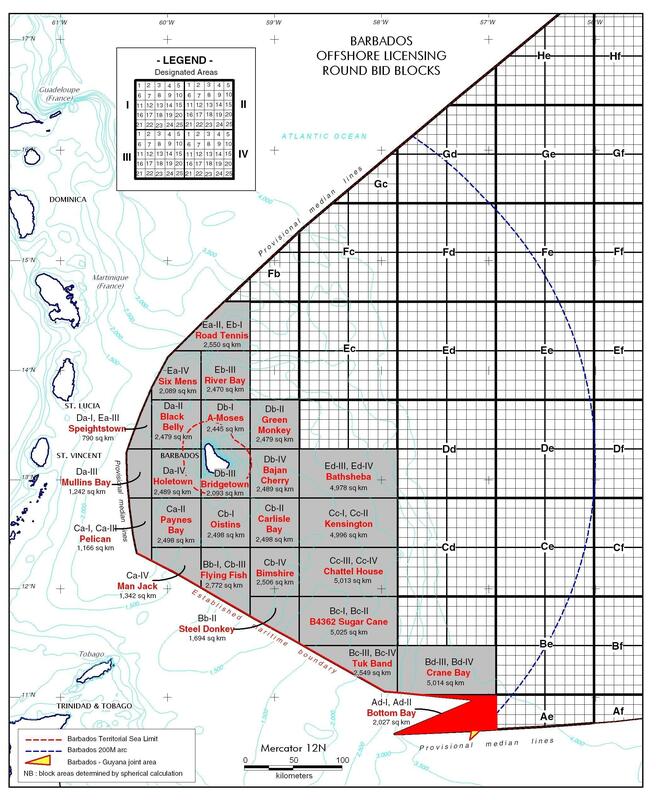 However, there is an issue that the IOC’s perhaps have not taken in account, that is that two of the block are in venezuelan waters, the Bottom Bay blocks Ad I and Ad II. We expect that the venezuelan government will issue a diplomatic note to the government of Barbados asking for clarification and the Venezuelan oil company PDVSA will issue a warning to the OIC’s on the issue. 1. It’s claim to approximately half of Guyana’s land area. 2. Venezuela’s Maritime Treaty with Trinidad. In 1990 Venezuela and Trinidad agreed a treaty delineating their maritime boundary. This treaty can be found on line HERE. This treaty allowed the development of Trinidad and Tobago’s offshore oil resources. However this treaty had two unforeseen impacts. First it tacitly recognised Venezuela’s claims on half of Guyana, and secondly it pushed Trinidad’s territorial claims north which is what led to the Maritime border dispute between Barbados and Trinidad. The impact of this can be seen in our post How Much Gas Does Trinidad Have? Indeed the main sticking point in the negotiations was the Trinidadian position that Barbados should recognise the 1990 treaty. The UNLOS council held that two countries could not bind a third without it’s consent and hence the 1990 treaty had no impact on Barbados. The maritime boundaries are currently as seen in the diagram below. 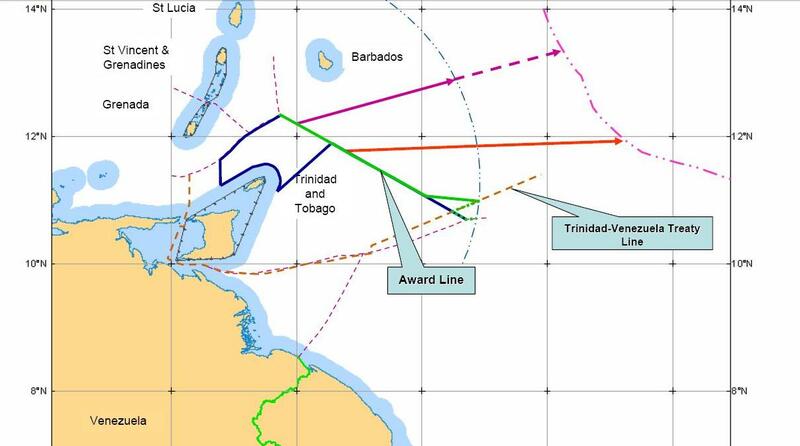 The purple line indicates Trinidad’s initial boundary claim and the brown line indicates the claim they put forward to the UNLOS Council. The green line represents the final decision of the UNLOS Council. The result of the UNLOS is that the 1990 boundary between Venezuela and Trinidad extends into what is (and always was) legally Barbados’ waters. 1. Half of Guyana is actually Venezuela. 2. That two countries (Venezuela and Trinidad) can commit a third and fourth countries (Barbados and Guyana) to some form of agreement or treaty without consulting them and without their agreement. In short, the Venezuelan claim is baseless. Other interesting information on this topic. Bird Island Again! – Grenada in Maritime Boundary Dispute With Venezuela. On page 8b of our Sunday Sun paper was a full page ad purporting to be paid for by the Honourable Hamilton Lashley, promoting the Venezuelan PetroCaribe agreement. 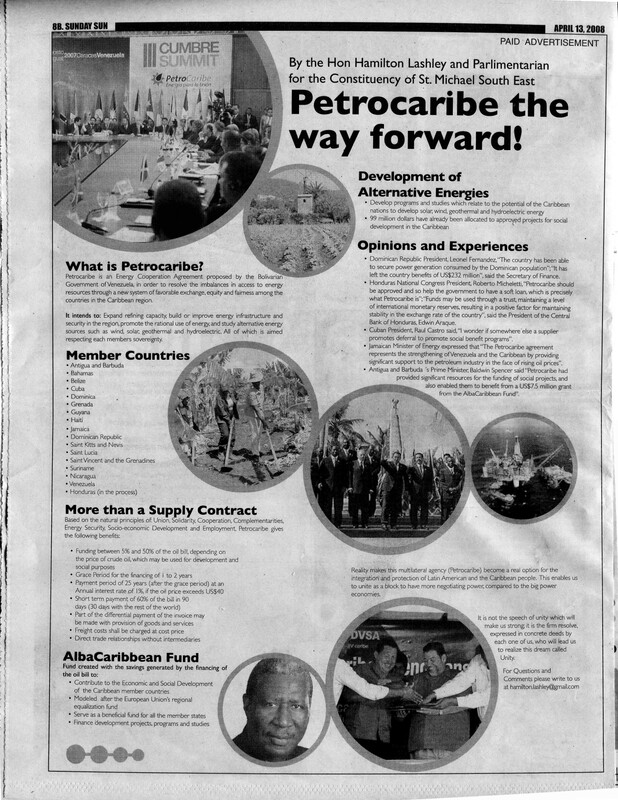 It’s headlined “Petrocaribe The Way Forward” The ad is extremely well produced in terms of design and writing style, however it just doesn’t seem to be the sort of thing that an opposition parliamentarian would produce. Let’s face it when parliamentarians are in opposition they don’t have alot of money to throw around. Our position on PetroCaribe is well known a quick search of this site will lead to many articles on what we think of Mr. Chavez’s initiative. In a nutshell we think that Petro Caribe will saddle the countries of the english speaking Caribbean with massive debt and make them subject to the whims of a Venezuelan government that historically has shown itself to be hostile to the region’s best interests. When we read the ad we felt it read like a Venezuelan press release, so we went looking on the net and…. IT DOES READ LIKE A VENEZUELAN PRESS RELEASE!!!! The following paragraph comes from “Hamilton Lashley’s” ad. What are they odds of these two articles being written by different people? Probably about the same odds as winning the lottery five times in a row! Has anyone else noticed how all the major bankers are lining up to tell us how the take over of RBTT by RBC won’t affect competition in the Barbados banking market place? First John Beale and now Oliver Jordan who are both saying the same thing…. PRESIDENT and CEO of RBTT Bank Barbados Limited, John Beale, does not foresee any significant impact on the local banking sector from the recently approved amalgamation between RBTT and the Royal Bank of Canada (RBC). Speaking to Business Monday, Beale stated I dont think it will have a great impact, I dont think it will affect the competition. You’ll pardon us but somehow we can’t see that the removal of one of the major banks from a marketplace that verges on an oligopoly won’t affect the competition. Maybe we’re just cynical but despite the goodly efforts of Mr. Beale and Mr. Jordan we remain rather skeptical. Is The Barbados Stock Exchange Becoming Irrelevant? Is it already? We on the margin were reflecting on the recent conclusion of the Neal & Massey BS&T takeover. Neal & Massey were successful of course in buying the entire company. Some 97% of shareholders willingly took the offer and the remainder were bought out by N&M following the 90% rule. (If you own 90% of a public company you can take possession of the other 10% of shares just by paying for them). So lock stock and barrel, BS&T as an independent entity is history. What was once considered the symbol of white corporate power in Barbados has been sold (but that is another post). So what happens next? Of course the company will be de-listed from the BSE, it’s now a wholly owned subsidiary so it won’t be traded. As a result the numbers of companies on the exchange take a hit. This will be the latest in a series of reductions in the number of public companies in Barbados. Island Properties Ltd. was taken off the exchange by Colin Brewer & Tony Hoyos, Life of Barbados was taken down by the Mutual (now Sagicor), BWIA was grounded by the Trinidad Government. If we want to think back that far Plantations Ltd. went in a long agonizing slide into oblivion. Now we have BS&T joining the ranks of companies that were once public. Along with this slow dwindling, there is a scarcity of new companies going on to the exchange. Of course unless you count Sunbeach (we won’t go any further on that one). To make matters worse there’s an overwhelming tendancy for people to buy shares and then hold onto them for long term appreciation. So we have far more buyers than sellers. The mutual funds have added a new dimension but the returns (if you take out the BS&T takeover) have been pretty much moribund. Merging the regional exchanges will buy time, however the fact of the matter is the investment arena in Barbados is pretty stagnant. If you listen to the rumour mill, the stories floating around about “back room deals” may or may not have substance, but they don’t engender confidence in smaller investors. The management of the exchange must see the trends, and also must realise that from a long term view, if they do not take action they will be consigned to the same file folder that currently holds BS&T. Now that the dust has had a chance to settle, we on the margin have been reflecting on the sale of Cheffette Holetown. At $40 Million for the site Cheffette would have taken the offer. How many years of profit is that from the Restaurant? Further that’s enough money that they could build a second restaurant nearby and still have money left over. As a business deal this is fairly straight forward, Cheffette got an offer that was simply too good to turn down and that is that. From an economic point of view, the Holetown site in condos will contribute more to the economy than it would as Cheffete. Certainly it would be part of the foreign exchange earning sector rather than being a user of foreign exchange. Economically this is good for Barbados as well. However one of the very few remaining windows to the sea will close when condos go up on the site. Locals will have to go in either at the Holetown Police Station (the old Pizza House restaurant) or go all the way up past Sandy Lane to access the beach. Heading south after that we believe the next opportunity for beach accesss is Paynes Bay. The other factor at work here is that there’s only so much beach front land in Barbados. The simple law of supply and demand means that prices for land on the coast will skyrocket in the face of huge demand fed from outside of the island. Hence we can hear about $40 million being paid for a relatively small piece of land. Remember all of those little chattel houses in the Garden in St. James? Little gold mines each one of them. Now because the land costs are skyrocketing developers need to do two things 1. increase the value of each condo unit and 2. increase the number of units on the lot. This means that development along the beach is going to be high value, and is going to maximise the land use (so much for beach access for locals) and further is going to go up and up and up. This results in what we are seeing at Paynes Bay in St. James where the people on the land side of highway one stop seeing the sun around 3.00pm in the afternoon each day. While these words are being said images of high rises next to the beach are being shown. We think that there is a need for a policy intervention by Government that puts the brakes on this form of development. Now this will have to be done with a light touch otherwise we run the risk of killing the goose that laid the golden egg. One possibility is restricting future high rise structures to the land side of the road. We are not saying no to development of the coast, we are simply saying if we continue as we are going now we will end up being one of those islands that no one wants to go to. The economics of it are inexorable. Now is the time for an enlightened policy response. Minister of Tranport, Works and International Transport John Boyce made a comment in the house yesterday about the Government’s potential use of Build Operate Lease Transfer (BOLT) arrangements in the future. Minister of Transport, Works and International Transport John Boyce told the House of Assembly yesterday during debate on the 2008-2009 Estimates of Revenue and Expenditure that BOLT arrangements were supposed to generate savings and not additional costs. The previous administration made use of several of this type of arrangement. However the nature of the implementations often left questions on the transparency of the deals. This was noted in an IMF report on Barbados. The report makes a number of reccomendations with regard to this Public-Private Sector arrangement. Consideration should be given to developing a legal framework that covers roles and responsibilities of PPPs, a clear definition of PPPs and their scope, as well as rules related to procurement, accounting, reporting, and audit of PPPs. All forms of guarantees related to PPPs should be disclosed, and an assessment made of their likely fiscal cost. PPP contracts including renegotiations should be publicly disclosed. Standardization and simplification of contracts would be desirable. Future payments required under existing PPP contracts should be reported and included in medium-term planning. The transfer to accrual accounting should ensure the proper accounting of PPPs and related debt. We on the margin would be much more reassured by the implementation of a legal framework to govern the use of BOLT’s and similar arrangements than simply Mr. Boyce’s statement of “Trust us”. A Further Thought on Air One…. and other investments. A further thought on the AirOne story…. The airone project represented a significant investment project that would have brought considerable jobs to Barbados (or Jamaica for that matter). Because of the upward movement of oil prices, that project won’t be happening now. If you talk to people in the legal and financial fields there is a feeling of caution in the investment community. There are a number of projects that are still going ahead as their investors are committed, however there are some that have been put on pause as investors wait to see what will happen with the global economy. If Airone has been put on hold, it does make u wonder what other projects are being put on pause? With Oil at $113 a barrel, it may be sometime before they get considered again.